With over 25 years of orthopedic experience, Dr. Freedberg is known locally as, “The Knee Expert.” Most recently, he developed an innovative double bundle ACL Reconstruction Technique in conjunction with Biomet with whom he is an independent contractor; which is now being recognized and implemented, internationally. Beyond knees, Dr. Freedberg provides a complete range of orthopaedic surgical services including full and partial joint replacement. Dr. Freedberg is a Board Certified by the American Board of Orthopaedic Surgery and has subsequently been recertified twice by the same governing board. Also subspecialty Board Certified by the Sports Medicine American Board of Orthopaedic Surgery and the American Forensic Association. 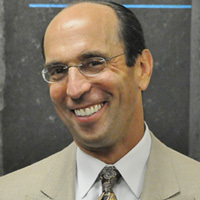 Nationally renowned, Dr. Freedberg was deemed a Master Instructor of Arthroscopic Surgery by the Arthroscopy Association of North America, serves as an instructor for the American Academy of Orthopaedic Surgeons, a consulting physician to the Player’s Association for the NFL and MLB, team physician for five local high schools, recognized by U.S. News as a Top Doctor and in April 2011 was awarded the “Best Doctor Award” by Chicago Magazine. Dr. Freedberg lectures on his theories and techniques, on subjects that include not only knee reconstructions but many other joints of the body including the shoulder of which he is also recognized as an expert by his peers. He has published numerous articles on the subject of arthroscopy. He is presently involved in novel research on the Anterior Cruciate Ligament (ACL) with the robotic knee testing device which is a revolutionary computerized knee testing device. Dr. Freedberg believes that each patient deserves the utmost in service. He takes extra time to provide each patient with the individualized care they deserve and treats every patient as though they are a family member.